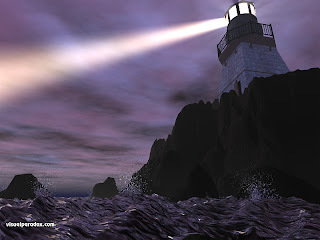 COMPASSIONATE CLIMATE ACTION: Be a Beacon ... or a Foghorn! Be a Beacon ... or a Foghorn! My wonderful friend, Elise, worries about my spirits sometimes — especially when she hears me rant and rave about climate change on a listserve for environmental educators. Her lastest missive to me had "Being a Beacon" in the subject line. "You can be a beacon. Beacons are steady, and calm and there and constant. You need to refuel your light sometimes, and be calm. And trust in being a beacon. Not try to be a foghorn too! "We are small but remember the joke about the tent and the mosquito. What do you want people to DO? You are a teacher. I've said this before. However crazy all this makes you feel, what people need is direction, a steady flow of ideas about things to practically do to make change. To feel enabled, inspired, at a scale they can manage. Paul Hawken calls us The Movement. This means we can patiently, steadily, invite people to move in a new direction. "So maybe you need to do a silent retreat and go into your own peaceful inside and rest for a while. The stuff won't go away out there — it will just keep going but you will be calmer and different and stronger and able to lead from a place of peace. We need to become wise women! And that means grounded and calm and secure in what needs to be done. Wise women don't yell at the other side — they quietly find ways to exude a countering energy. And you have lots of that!" Bless her, she is a good friend. One who cares, about both me and the state of the climate. However, (a) I've seen evidence that "yelling at the other side" has worked in the past (think Minimata, think Love Canal), and (b) WE DON'T HAVE TIME TO BE CALM OR PATIENT!! So, despite my good friend's invitation (admonition?) to soften my approach, I DOUBT I'LL BE ABLE TO! When my grandkids ask me what I did when I found out about the climate change emergency, I will be able to tell them that I yelled and screamed, ranted and raved, and tried to warn others ... that I told as many people as I could, as often as I could. Because I loved them, my grandchildren, before they were even born. p.s. My appreciation and admiration go out to all the Wise Ones who serve as beacons in this world — including my friend, Elise. A Lesson in the Hazards of Making Assumptions! Why Aren't We Talking in Big Graphic Terms? Did World Water Day Flow Past You, Too?